0	What does a 1.50ct Diamond look like vs. a 2.0ct Diamond? How Colored Metals Can Make Your Diamond Shine Brighter? 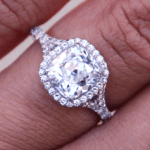 Want to Re-Set Your Engagement Ring? Read this First!